Surprise pin release! 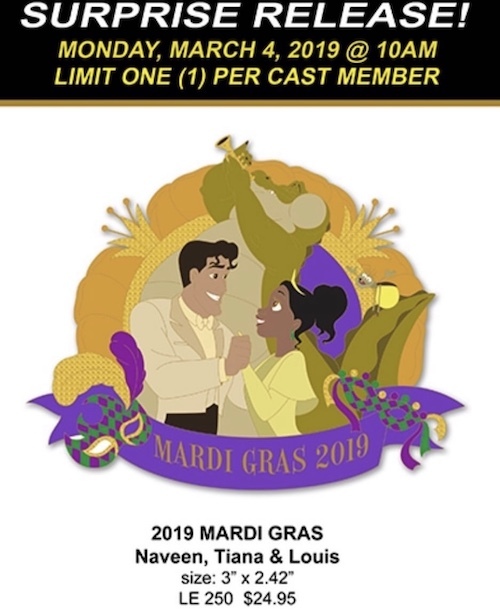 Here is a look at 2019 Mardi Gras pin at Mickey’s of Glendale! Retail price is $24.95 and the LE size is 250. Available only to Disney Cast Members. This pin features Naveen, Tiana & Louis from Disney’s Princess and the Frog. Pin will be available in store on Monday, March 4, 2019 at 10AM for Disney Cast Members.